Knitting, crochet, weaving and spinning supplies. Patterns using Magic Cables, a simple, fast technique for knitting mock cable on a knitting machine. Includes free patterns, links and knitting tips. Offers a variety of handwoven articles in contemporary, traditional, and historical knitting patterns. As well as knitting patterns. Knitting machine patterns, Brother knitting machines, tools, yarn, paints, and DesignaKnit software. Includes free patterns and links page. Production machine knitting source. Knitwear specialist for schools and businesses. Classes, clubs, free patterns, new patterns, yarns, new and used knitting machines, workshop/seminar schedule. Knitting and crochet needles, patterns, supplies, and accessories. Yarns, patterns, kits, and variety of knitting tools. Hemp and blends for knitting, weaving and crochet, and knitting patterns specially designed for use with these yarns. Yarns, knits, patterns, books and supplies for knitting. Also a class schedule, newsletter, and knitting wallpaper. Specializes in knitting boards, patterns, and how to books. Includes an online tutorial section covering stitches and techniques. A selection of original knitting patterns by Rita OConnell. Also free tips, hints, and writings, and knitting class topics. Artisan Knitting Machines. Machine Knitting books, patterns, yarns, accessories. Includes information on DesignaKnit software newsletter and tips of the week. Offers knitting kits, intarsia landscape patterns, and instructions for hand and machine knitters. Free online knitting tutorials. Ordering information available. Sheepskin boots and slippers, foot warmers, wool jumpers, sweaters, cardigans, and vests. Also knitting yarns, patterns, and knitting books. Australia. Passap and Studio knitting machines. Books, patterns, yarns and accessories. Plus many accessories for the Toyota knitting machine. Offers knitting and crochet yarns, kits, patterns, accessories and informative pages. Offers hand spun yarn, hand painted knitting needles, kits, patterns, and gifts. Knitting tips also available. A selection for toys and dolls. Also free patterns. Offers a selection of knitting patterns, yarns, discussion board, free patterns, notions, and a stitch library. Brother machine knitting Fashion magazines, manuals, accessory manuals, pattern books and Desgnaknit. Machine knit poncho patterns for babies, children and adults using standard Japanese knitting machines. A selection of patterns for toys and dolls. Price list, order form and pictures of completed toys. Miniature knitting hand made in Australia by Lesley Manieri. Kits, patterns, dolls and completed products available for clothes and furnishings. If the business hours of Columbine Yarns in may vary on holidays like Valentine’s Day, Washington’s Birthday, St. Patrick’s Day, Easter, Easter eve and Mother’s day. We display standard opening hours and price ranges in our profile site. We recommend to check out yarnies.com/ for further information. 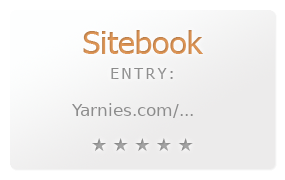 You can also search for Alternatives for yarnies.com/ on our Review Site Sitebook.org All trademarks are the property of their respective owners. If we should delete this entry, please send us a short E-Mail.